When performance matters Brady Printers models BBP31 and BBP33 are two powerful printers that take on ALL your labeling needs with unprecedented ease! No more tedious, time-consuming setups. No more difficult-to-load materials. No more wasted labels. No more hassles. These printers are so simple to use and so incredibly fast to set up that most of our customers don’t even believe us the first time we show them. But believe it, because it is really is that easy, and you really will be that fast, and you really will avoid wasted labels. 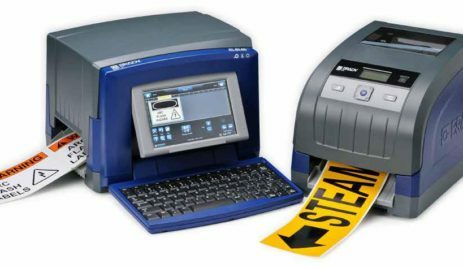 Industrial label printing that’s simple, powerful and brilliantly fast. Exactly the way label making should be. Automatic label setup with no calibration. The printer “reads” critical information from your cartridges and automatically sets up the label correctly in the printer or your Brady software. The printer does all this for you! Drop in the cartridge, lock it and start typing – that’s all you need to do! Brady Printer BBP 31 Sign and label printer features stand-alone printing & an ultimate ease of use. Just walk up and print. Literally. The best choice for facility and safety and lean/5S “Kaizen event” labeling with a printer that operates stand alone or from your PC. Brady Printer BBP 33 label Printer is PC-only printing with expanded material options. It features never-before-seen supply changeover speed and waste-free set-up in a PC-only printer. It also features full ranges of facility, safety & lean/5S label materials as well as die cut labels for, wire ID, lab ID and product ID. Wire ID, lab ID & general ID die cuts – 310 parts, 31 materials, plus custom sizes available! Download the Brady BBP31 and BBP33 printers brochure below or call an Royal Wholesale Electric specialist at 714.835.6211 for more information.